How does a cone differential work? A cone differential works much the same as a clutch plate differential. However, instead of clutch plates, friction lined cones are used. Pressure from the preload spring and side gears forces the cone into a dished depression in the differential case. This locks the cone and side gear to the case due to friction. The locking to the case results in power being sent to the wheel with the most traction. How does the Detroit locker (ratchet differential) work? The ratchet differential works in a much different way to the previous types described. Power is transferred to the wheels by engaging or disengaging sets of meshing teeth. This is sometimes referred to as a dog clutch. Additionally, drive power to the wheels is not related to traction/rotational resistance. It is instead related to the relative wheel speed among the wheels. 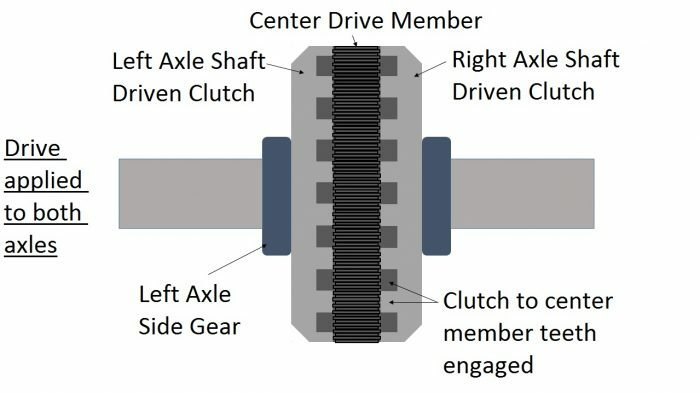 When driving straight, the teeth on both sides of the differential are engaged, thus providing drive to both wheels at the same rate as the differential case is rotating. When turning, the outside wheel rotates at a faster rate. This mimics occurrence of the outside wheel losing traction. The speed difference causes an internal cam and ramp to disengage the teeth on the outside wheel so that all power is sent to the inner wheel. This way, drive power is sent to the wheel with the most traction. These types of differential tend to be durable but can be noisy and hence are more often used in racing and off-road vehicles. Talk to us at Houston Rebuilt Axles for advice on which differential best fits your purposes. We can provide you with the most cost-effective options. The Torsen® (Torque-Sensing) traction differential is a limited-slip differential made by the Gleason Corporation. They have been applied to a large variety of automobile manufacturers spanning France, Germany, Italy, Japan and north America in addition to aftermarket applications. This broad use may be due to the fact that Torsen differentials come in multiple types and can be applied to the front, center or rear differential. It is difficult to explain their operation even with visual aids and understanding the multiple types is beyond the scope of this article. As we have been talking about only rear differentials, we will stick with the original Torsen design designated ‘Type-A’. The components of the Torsen differential consist of helical gearsets known as worms and worm wheels. The worms are the drive gears and there is one attached to each axle shaft similarly to side gears in the previous differentials described. The worm wheels are the driven gears which ride on the worms. They are held in place by the differential case in a manner somewhat similar to how the spider gear is held by the differential case. Where the worm can drive the worm wheel, the worm wheel cannot drive the worm. Each worm gear on each axle shaft will have a set of worm wheels riding on it. Each of these worm wheels will have a partner worm wheel on the worm associated with the other axle in the differential. 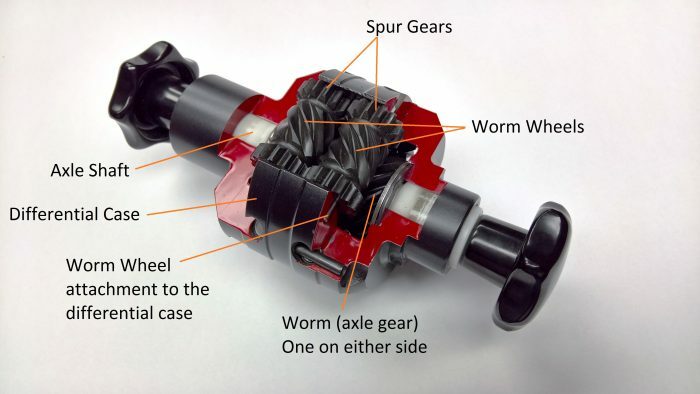 The partnered worms for each axle shaft are connected by meshing gears on the ends of the worm wheels known as spur gears. These ensure the worm wheels turn together. How does the Torsen Differential works? Under normal straight ahead driving conditions with symmetrical traction, engine power drives the differential case. This rotates all the internal components as a single unit in the same way as all previous differentials described. As the worm wheels are held in place by the differential case, they lock with the axle worm gear and the axle shaft rotates with the differential case. Upon turning or single wheel slip, the relative drive to both axle shafts changes. The speed change is transferred to the slower axle via the meshing spur gears of the partnered worm wheels. This gear interaction results in drive being applied to the slower/higher traction wheel. This is not due to rotation of the worm wheel as the worm wheel cannot drive the worm. Instead, it causes the worm wheel on the slower axle to lock to the worm and transfer power to it from the faster moving axle. The worm wheels can however, rotate around their own axis allowing them to rotate around the worm. Drive can be applied in varying amounts depending on how much they rotate around the worm and how much they lock to it. 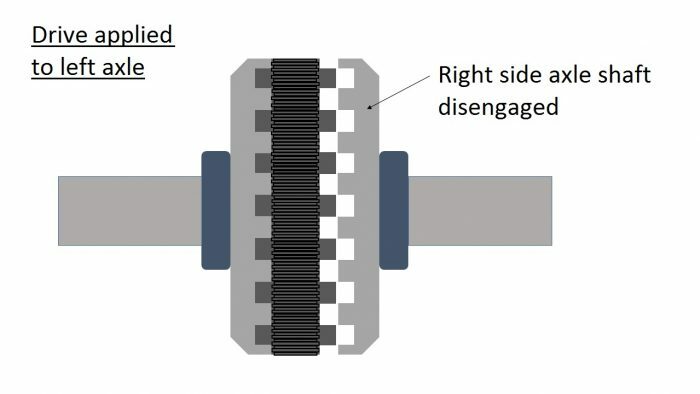 Management of the interaction of all the gearing (such as the angle of the worm teeth) within the Torsen differential allows it to be tuned to a specific torque bias.